Many farmers are not getting the best from their grassland because of a lack of potash. Around 50% of grassland has below-target soil K levels and is very responsive to added potash. The problem is increasing, because the average application of potash fertilisers to grassland has fallen by 30% in the last ten years. Far too little soil analysis is undertaken on grassland farms and fertiliser and manure usage is therefore often not soundly based. This can result in costly penalties from either under or over use. A major problem is that this is not evident with deficiency symptoms or identifiable poor growth. Whilst precision farming techniques can now provide arable farmers with increasingly sophisticated information for every part of every field, most grass farmers still have very little knowledge of individual field performance because forage harvesting equipment generally provides no information on crop yield. This is of vital importance for both phosphate and potash because manure and fertiliser use should be related to crop offtake. For the same reason of lack of measurement or estimation, there is frequently enormous scope to improve the effectiveness of manure use, again resulting either in very valuable yield improvements or fertiliser cost savings. New varieties and grass mixtures are constantly improving forage potential but this is not being realised in practice where potash supply is inadequate and this Cinderella input has become the limiting factor to grass performance. The objective of this leaflet is to improve understanding of potash and provide recommendations to ensure more cost-effective usage which will result in better forage performance and lower unit costs of production. Potash is essential for full yield & high quality feed value. Potash is used to regulate the movement and storage of solutions throughout the plant which might be compared to the blood system in animals or humans. This is clearly a very wide ranging and vital role, affecting nutrient uptake, photosynthesis, rate of growth and feed value of the forage. These functions require larger amounts of potash in total in the plant than any other nutrient including nitrogen. If adequate amounts are not present grass will not grow or yield as it should. There is also a particular relationship between nitrogen and potash. The large and worthwhile growth response of grass to nitrogen is dependent upon a balanced supply of potash both to assist N uptake by the roots as nitrate and to support the conversion of this to the complex proteins needed by the animal. Potash is also very important in the microbiological fixation of nitrogen by root nodules in legumes. If clover is required to play a significant part in the sward the supply of potash is of even greater importance. Grass requires a balance of nitrogen and potash to obtain full response to applied nitrogen. Careful optimisation of nitrogen is a waste of time if potash supplies are not adequate. As shown in the diagram both the level of yield and shape of response curve are radically altered by potash limitation. Application of potash alongside optimal nitrogen increased annual yield from 9 to 14 t/ha. If potash supply is limiting, the uptake and utilisation of nitrogen will be restricted. If soluble forms of nitrogen remain in the soil and are not taken up there is increased risk of leaching giving environmental concern when through-drainage occurs. Ready availability of both nutrients helps the uptake of the large requirements of N and K necessary for full yield. During rapid vegetative growth, the large uptake of nitrogen as negatively charged nitrate ions (NO3–) is normally balanced by a similar uptake of positively charged potash ions (K+) which maintains the electrical neutrality of the plant. Potash is also important to achieve good feed value as it affects the conversion of nitrate to protein. Total protein yield will be significantly reduced if potash is limiting. The chart shows the increase in both the hay yield and the % crude protein resulting from the application of potash, with the total protein yield rising by almost 45%. Potash deficiency is not easily identified in grassland and is sometimes referred to as ‘hidden hunger’ because losses occur despite any recognisable visual symptoms. Typical deficiency symptoms in grasses are yellowing and chlorosis of the edge and tip of older leaves, with progressive senescence. Similar symptoms result from a number of other causes such as – drought, water-logging, wind, etc. Clovers become less vigorous with chlorotic speckles over the whole of the leaves which are frequently smaller than normal. After grazing, vigorous and darker regrowth in dung and urine patches is in contrast to yellower, poorer growth when potash is deficient – this can also reflect nitrogen supply however. In practice visual diagnosis is an unreliable means of detecting potassium shortage and regular soil analysis should be used to determine potash status. Grass takes up potash from soil reserves which should be replenished by additions of manures or fertiliser equal to what is removed. It is inefficient to allow soil reserves to fall to levels where grass growth is directly dependent upon fertiliser applications. The quantities of potash removed in silage are large and for multi-cut systems they are often greater than for any arable system. Clearly it is necessary to replace these nutrients and logical to return manures to silage and hay fields. In practice, however, this may not occur because cutting fields are more remote or not so convenient. It is common to find fields which regularly grow maize with high applications of manure and which have excess soil P and K whilst grass silage fields do not receive manure and have deficient nutrient levels. The situation is very different with grazing, because around 90% of the potash in grazed grass is returned directly to the sward and the need for potash application for grazing is low. The return, however, may not be even and fertility can build up where animals congregate to drink, feed or lie, which means a run-down in other areas where they only graze. Common sense sampling can identify such differences and guide the need for additional nutrients. Potash is not lost directly to the atmosphere and losses by leaching are generally small. Moreover potash leaching has no known adverse environmental effects. It has been shown that most soils lose only about 1 kg/ha of potash for every 40 mm of excess rainfall. Therefore losses by leaching for lowland grass production are normally less than 15 kg/ha K2O annually. Losses are particularly low when there is a good balance between the supply of K and N and grass yields are high. heavy rain occurs within about four days of application, particularly in autumn and winter. Potash losses may amount to half the amount applied under such conditions. This is a serious financial loss and the associated phosphate loss may provide an environmental hazard. Losses also occur from manure and in silage effluent, with up to 50% of available potash at risk in uncovered stores. Potash is normally freely soluble and loss of the liquid fraction of animal wastes, crop effluent, etc. will lose most potash. Potash reserves in the soil are more effective at supplying the plant than fresh fertiliser applications. Impoverished soils will often not produce the same yields as fertile soils even if higher fertiliser rates are applied. An adequate reserve of phosphate and potash to feed the crop should be maintained in the soil by using fertilisers and manures to replace what is removed by cutting or grazing. For soils with low reserves, extra fertiliser should be used to restore fertility to target levels. For soils with high reserves, fertiliser usage should be reduced or omitted. Knowledge of the fertility level in the soil is essential to determine fertiliser policy. It is impossible and irresponsible to guess correct fertiliser use without soil analysis which should be undertaken about every 4 years. Soil analysis provides a measure of the nutrient level available to the crop – the total level of potash (and phosphate) in any soil is very much larger but is not relevant to plant use. The physical condition of a soil is also of vital importance e.g. structure, depth of soil, level of organic matter and stone content. These must be considered first before interpreting soil analysis (see PDA Leaflet 24, Soil Analysis, Key to Nutrient Management Planning). Because soil fertility varies within fields and according to soil conditions and climate, soil analysis is not a precise measurement and the index system has therefore been developed to indicate the general pattern of crop response to added nutrient. Soil K index 2 is divided into a lower and an upper half denoted by minus and plus signs. For soils under cut grassland sampled in 2002/3, 9%, 41% and 26% had K indices of 0, 1 and 2- respectively, with only 24% having index of 2+ and above. K status was marginally better in grazed grassland, with 3%, 33% and 32% at K indices of 0, 1 and 2- respectively, and 32% having index of 2+ and above. Herbage analysis can be used as an adjunct to soil analysis or as an extra diagnostic tool in specific circumstances. When more K is provided than is necessary, grass may continue to take up K with no change in yield, so that % K content in the plant increases. This should be avoided on cost grounds, but may also reduce magnesium availability and increase the risk of hypomagnesaemia (staggers) although the more frequent reason for such mineral disorders is that total dietary magnesium supply is inadequate. Animal stress such as calving/lambing increases the risk of mineral imbalance in the animal. Adverse weather conditions provide a double risk in that stress on animals is increased and growth rate and nutritional content of herbage is reduced. Magnesium problems are more likely on light soils and in other situations where soil Mg is poor. Maintenance of soil Mg at index 2 by the use of magnesium lime or fertilisers is advised where there is a history of problems. Potash requirements for grazing are low as detailed above but it is obviously prudent to avoid any potash applications, including FYM or slurry, at times of greatest risk of mineral imbalance such as during the spring flush of growth and in the autumn when grass supply and value is decreasing. There are no risks of upsetting magnesium balance in silage if proper calculation of potash needs are undertaken based on soil analysis and crop removal. Again it is essential to include the contribution of manures in the calculation. If magnesium intake from forage is low, animal requirements should be achieved by supplementary provision. For cut swards there is a much greater risk that potash supply is insufficient for full yield than of over-high application. 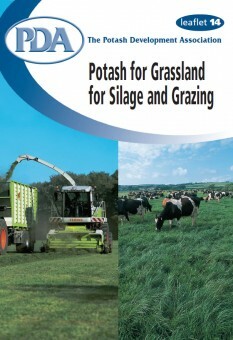 This topic is dealt with in more detail in PDA leaflet 6 – Potash, Magnesium and Sodium Fertilisers for Grass. Phosphate and potash use should be based on the amounts removed. In some situations, particularly with very high herbage yields, the annual quantity of potash removed may reach 500 kg K2O/ha. This wide ratio frequently results in over-use of phosphate and under-use of potash leading in time to excess soil P, which is undesirable for environmental reasons, and to low soil K which will reduce yields. Such an imbalance of P and K is doubly costly because of yield loss from K shortage and because phosphate is considerably more expensive than potash. The same principles of potash manuring apply to all systems of production and are even more important for systems which rely on clover to generate nitrogen by biological fixation as this is seriously affected by any shortage of potash. The intensity of stocking and conservation yields clearly affect the amount of potash removed and the ‘standard’ recommendations below should be adjusted accordingly. Yields from grass-white clover swards without N fertiliser are normally some 80% of those from grass with high N application (as in example below). Lucerne and red clover in organic systems will, however, commonly give as high yields as grass, leading to very high levels of removal of potash. The ‘standard’ potash recommendation is 170 kg/ha (made-up of 140kg to replace removal in 23t/ha silage cut + 30kg to improve soil K). Adjust removal amount for lower yield: 140 x 15/23 = 90 and add the + 30kg to improve soil K = new recommendation of 120 kg/ha. On an organic unit this would require 17t/ha of cattle FYM to supply this amount of potash. If this quantity is not available the difference should be made up with a suitable potash fertiliser. (See PDA leaflet 23 Potash for Organic Growers). It is important to ensure that potash removed in any system is replaced if soil fertility is to be maintained and a sustainable system operated. Manures on farm simply re-cycle nutrients that were in the soil to start with, plus some nutrients from bought-in feeds. Even where manures are stored and used efficiently there will be some natural losses from the system as well as an ‘export’ of potash in whatever products are sold off the farm. Approved potash fertiliser or imported manures will be needed to replace these quantities and maintain soil fertility. This is often the area of greatest scope to improve grassland nutrient management and to reduce fertiliser costs. Manures contain valuable levels of phosphate and potash; cattle slurry and FYM should provide P and K in the ideal ratio required for grass for silage or hay. A manure management strategy should in the first place use manures on crops and on grass for conservation, rather than on grazed grass, which already receives nutrient returns from the grazing animals. Typical composition of manures is given below. The availability within the first year after application is 60% for phosphate and 90% for potash. There are however big variations in composition, particularly with differences in the dry matter content of slurries, so that occasional analysis of the nutrient contents of manures should be carried out. A slurry hydrometer can be used for a rapid check of dry matter, total nitrogen and phosphate contents. It is clearly also important to check application rates in order to calculate the quantity of nutrients applied. Slurry and poultry manures are best applied to land for silage or hay in late winter-early spring, close to the period of active grass growth and demand for nutrients, in order to reduce losses, particularly of N.
A wider range of application times is possible for solid FYM. Slurry applications should not exceed 50 m3/ha to minimise risk of nutrient losses via surface run-off. Run-off losses may be high if there is high rainfall within 3 to 4 days of application, particularly in early winter. Applications for first-cut silage should be made by the end of March to reduce risk of poor silage fermentation. For subsequent cuts, the application should be made as soon as possible after harvest and it may be necessary to wilt heavily or apply additives for good silage fermentation. Manure application to land for grazing may reduce grass intake, cause nutrient imbalance and contribute to disease transfer. It is best to avoid slurry applications to grazing land in late winter/early spring. Pasture should not be grazed for one month, and preferably two months, after application or until all visible signs of slurry solids have disappeared. The requirements for P and K to be supplied from fertilisers and organic manures are given below. The recommendations are calculated to achieve full yield and maintain, improve or reduce soil P and K according to the soil index. Using these values it will take 10-20 years to raise soil fertility from the bottom of index 1 to the bottom of index 2. Replacement values (M) are based on the average yields shown – if significantly different yields apply, the rates should be adjusted accordingly. Rates should also be adjusted if herbage analysis indicates N:K ratios outside the optimal values. The supply of nutrients from manures must be calculated and fertiliser then used to rectify any shortfall in supply; see notes in next section on ‘Timing’. All fertiliser phosphate amounts should be applied early in the season for the first and second cuts especially if soil P reserves are low. For long term improvement less soluble forms of phosphate may be applied over winter. Timing of phosphate contributed by manures will largely depend upon practicalities of manure management and effects on the efficiency of use of other nutrients, particularly nitrogen. Care must be taken to avoid manure run-off; this risk should be assessed before applications in wet conditions or when heavy rainfall is possible. No more than 90 kg K2O/ha should be applied for any one cut during the growing season. Apply the balance over the previous autumn/winter as muriate of potash (60% K2O). If this application is missed, apply the balance to aftermath grazings at 30 kg/ha per grazing or during the next autumn/winter. Experiments carried out by ADAS at 23 sites in England and Wales showed no differences in first cut yields between K applied in November-December compared with mid-February to mid-March, although K recovery in the grass was slightly lower with the earlier application time. Make allowance for potash in FYM/slurry applied by reducing the fertiliser application nearest to the time of application of the manures. For example if manure is applied in mid season, reduce the fertiliser potash rate to second cut silage or mid season grazing. In multi-cut systems potash applications should be made for each cut. Do not apply potash for grazing during spring except in high N low PK fertilisers providing less than 15 kg K2O/ha per application. Around 50% of all grassland soils are at index 0 or 1 and for these the justification for using potash has been shown in many trials as illustrated. On the most deficient soils there may be a greater return from expenditure on potash than on nitrogen for the reasons detailed on page 4 especially as £1 spent on nitrogen will buy maybe twice as much potash! Trials have shown grass yield responses on K index 0 soils of between 37 and 65%, depending on the rate of potash applied (see figure). With muriate of potash at £140/t for example, the cost of the potash fertiliser applied per tonne of extra grass dry matter produced is only £6 with low input of fertiliser, increasing to £17 at the highest application rate. 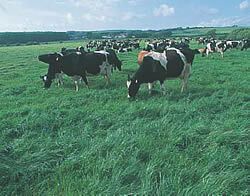 This is much below the value of extra grass dry matter which varies according to production system from £50 to £100/t. The Figure shows increases in grass yield of between 14 and 28% on K index 1 soils. The cost of potash fertiliser per tonne of extra grass dry matter produced in this case is £10 at the low input increasing to £24 at the highest rate. With livestock profits under severe pressure there is a great need to look for cost savings, but these need to be carefully targeted so that yield reductions do not outweigh any costs saved, for example by not applying potash. Nationally around 40% of grass soils are at K index 2 and are unlikely to show direct response to applied potash (fertilisers or manures) and for those at the higher range of this index band (index 2+) there are useful opportunities for potash savings. However, if instead of a normal replacement policy at index 2-, no potash is used in order to save costs, soil reserves will fall at a rate related to the soil type and amount of potash removed each year. Medium and light textured soils under a two cut silage policy could be expected to fall from index 2- to index 1 in a single season if no fertiliser or manure is applied. Fertiliser use would then need to be raised to restore soil reserves and yields in the short term might still not be as satisfactory as if soil K had been maintained. If the same extreme cost saving approach is continued at index 1, yield penalties are severe.